There’s a quest in Destiny’s new Rise Of Iron expansion that feels like a date with Destiny—and yes, that’s meant literally. Near the end of a meandering interplanetary excursion to find pieces of an exotic automatic rifle, your Guardian is prompted to “enjoy the view,” immediately after you’ve vanquished a host of aliens aboard the deck of a grounded spaceship. You step out onto the ship’s bow to gaze at the horizon of post-apocalyptic Earth, and your floating robot pal, your Ghost, appears. Suddenly, you’ve got gaming’s most unintentionally awkward knockoff of the “I’m flying!” scene from Titanic. This was a scripted moment designed to evoke some kind of warm feeling toward the ever-present droid companion and a sense of quiet, wistful reflection at returning to your old stomping grounds from the first moments of Destiny, but mostly, I just felt antsy. While impatiently listening to the Ghost natter on about how we complete each other, I sniped at a drone buzzing through the air and opened my inventory to find out what doodads and statistical improvements my newly acquired gun had. When could I get back to shooting stuff again? 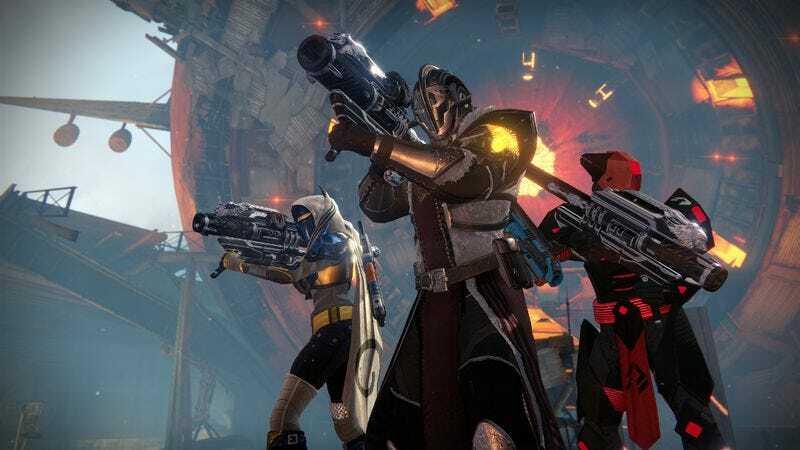 What developer Bungie fails to recognize is that nostalgia only works if you’ve formed an emotional attachment to something and there’s been enough time and distance to separate you from it. Rise Of Iron, Destiny’s fourth and final expansion, is proof that it’s impossible to miss what never leaves or changes. Take, for instance, Rise Of Iron’s story missions, many of them set on a sector of Earth called the Plaguelands. It’s a region that feels suspiciously like a copy-and-paste job of the all-too-familiar Cosmodrome—all craggy mountain ranges, snow-covered hills, and rusted-out underground bunkers—with the addition of some tentacle-like fiber-optic cables now strangling parts of the environment. It’s what the world might look like if conquered by Comcast. Turns out, all of the out-of-control cybernetics is something called SIVA, a plague of self-assembling nanotech once created to help humanity’s colonization effort but that is sealed away after it’s discovered to have terrible side effects. You’re asked to help Iron Lord Saladin battle SIVA-infected forces called Splicers (crimson-colored, peg-legged versions of the Fallen, the insectoid enemies of Destiny’s past) and defend humanity against the return of this techno-virus. Those are the only narrative points that could be squeezed from what is essentially a jumble of jargon stiffly delivered by Saladin and your Ghost. Either way, the story’s incomprehensibility isn’t a deal breaker. It can be completed so quickly—in about 90 minutes—that I immediately forgot about it and moved on to the next thing. After stopping SIVA, you’re left with tweaked versions of timeworn tasks—quixotic quests for rare weaponry, a few repeatable side missions, an additional mode of player-versus-player combat in the Crucible, an additional high-level raid, and hanging out in a new social space called Felwinter Peak. The mountainous social zone is more nuisance than necessity. There’s an entertaining little diversion built into the base that involves leaping your way to the summit ledge by ledge, but otherwise, it’s a dead space populated with a few characters and vendors. If you want to grab a Rise Of Iron quest and buy a gun from a vendor or pick up a generic quest, it means having to jumping between two different zones, which leads to a lot of time staring at your spaceship/screen-saver. Where Rise Of Iron comes into its own is the raid. Learning from the mistakes of Destiny’s previous dungeon, King’s Fall, which at times felt like an exercise in frustration and memorization, Wrath Of The Machines is an exciting, bordering on manic, collection of jumping puzzles, boss battles, and hidden goodies. It doesn’t necessarily make narrative sense to simultaneously throw bombs with two other Guardians at some armored alien beast and then shoot out a random monitor before the room explodes, but it’s a satisfying mission, especially when your team communicates well and is running on all cylinders. But once the final boss is dead, you’re back in the cold comforts of the rest of Rise Of Iron, which keeps sending you to places you’ve already spent countless hours in and recycling old activities with minor twists to fool you into thinking it’s brand new. On one hand, it’s a marvel how far Destiny has come over the course of two years. It launched in the fall of 2014 with so few things to do—so many mind-numbingly repetitive missions narrated listlessly by since-exiled Peter Dinklage—that it felt like a solid but ultimately hollow shell, a promise of a greater game to come. With Rise Of Iron, the game has finally fulfilled that great promise. The problem is it comes two years and hundreds of dollars in additional content later. Sorry, Mr. Ghost, I’m not ready to celebrate the good old days of Destiny quite yet. Purchase Destiny: The Collection here, which helps support The A.V. Club.